Before I played Animal Crossing: New Leaf, I’d never played a “real time” game before. By “real time” I mean a game that there is no pause button for. A game that operates on the same time as reality. The only way to pause the game is to shut it off and even then, it keeps going with or without you. Destiny is the second game I’ve played in this vein. Both games grabbed me from the get go, and part of the fun/appeal was the endless loop of better gear, better weapons, better everything. There was also one other thing: I didn’t want to miss out. In Destiny especially, it is such a social experience. You can get in the game, find that one of your friends is online, and you suddenly have an impromptu get together. As someone who has had relatively few of those in reality, it was a bit of a rush. To be able to connect with friends in such a way was sort of intoxicating. Add to that limited-time events, and you have a powerful allure to play a game. For me at least. This brings me to Destiny’s current “event,” Festival of the Lost. 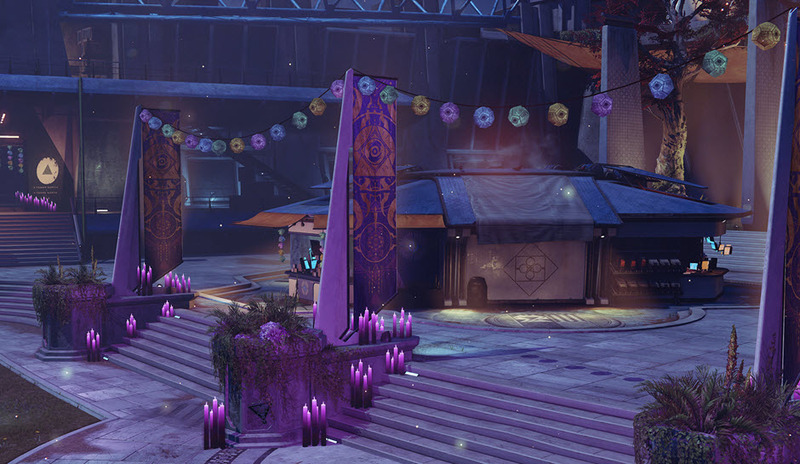 Basically, it’s Halloween in the tower, and everyone’s invited. Even Eris Morn and her crappy raisins. I love Halloween. I love the masquerade, the merriment, the mystery, and the atmosphere. Combine that with a game I already find engaging and I have a…well…a draw that begins to become an issue. The tower right now is beautifully decorated. There are engrams of many colors hanging like lanterns. There are piles of purple candles glowing up the corners. There are beautiful firefly-like particles floating about in a dreamy fashion. There are hilarious masks you put on to get candy from baddies both in the Crucible and PvE. It’s a sweet time to be a guardian. This festival happened at a time when I already told myself I would be deliberately playing less Destiny. I wanted to make a conscious effort to play a wider variety of games. There are just so many experiences to be had; why should I limit my gaming to Destiny? In truth, I wasn’t limiting my time on purpose, but that’s what happened. Between meeting up with friends and the limited-time events, if I wasn’t playing, I felt like I was missing out. No matter how bizarre that may sound, it’s how I felt. After playing many hundreds of hours of Animal Crossing: New Leaf, I made the conscious effort to put it down for good a while back. It was difficult from the get go, as Animal Crossing is full of whimsical events, and I just loved my little town of Xanadu and all the townsanimals in it. It wasn’t easy to say goodbye. So when it started getting closer to Halloween, I started to feel the urge to pick it back up so I could experience autumn and the holiday in my town. But I stayed diligent and haven’t booted it up since I quit. I miss having those events to celebrate. I like a sense of occasion, and in reality, it’s not as accessible to come by. So this Halloween I find myself at digital loose ends. 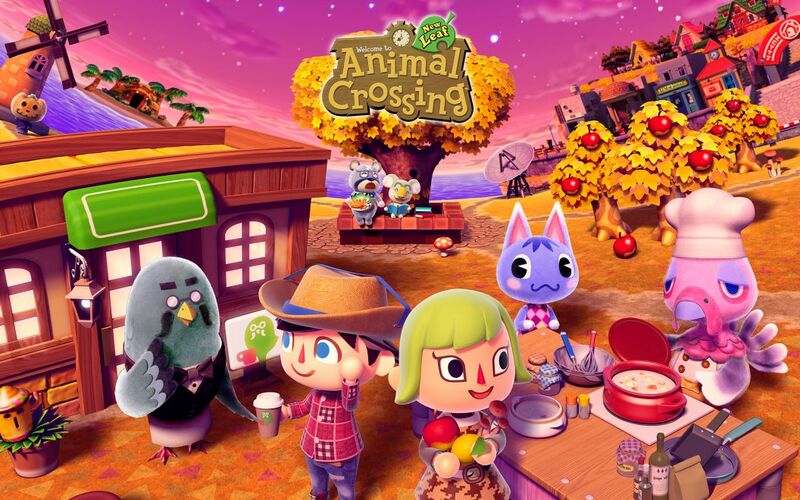 I am feeling the draw to both Animal Crossing and Destiny, and I’m trying to stay diverse and play other things. Just today, I finally played Goat Simulator and, while good silly fun, it just wasn’t what I wanted to be playing. I wanted to be back in the tower, meeting up with friends, and getting some space candy to fill my satchel. In essence: I feel like I’m missing out on something I can’t quite put my finger on. Has any game ever made you feel a similar way? If so, which? What did you do? Did you go back to the game or did you play something new entirely? With that I wish you each a lovely Halloween and please be safe out there. I’ve never really played a game that advances in real time until Destiny and Animal Crossing. I’m gonna see what my town looks like for Halloween tomorrow night.Have a good Halloween. See? Me either. It’s an odd experience, isn’t it? Halloween is super fun (and sort of tedious if you want everything) in ACNL. It’s is a interesting experience. I’ve just bought some candy and masks in the game. Thanks. I have the same feeling of missing out in Animal Crossing, you described it perfectly. Over here Halloween isn’t celebrated in real life, but even I wondered if I should pick up the game again today to help Jack! Nope, I didn’t. Before I knew it, October 31 was over, and I’m not in favor of turning back the clock on the 3DS…Jack must have been terribly disappointed..
And I have never changed the clock on my 3DS either. I mean other than for daylight savings time. I never wanted to chance time travel in Animal Crossing. Same here, plus I like my activity log on my 3DS, always fun to look back at all the steps I took in past years. I did check into my game yesterday and today for a chance to collect the Mush furniture. I never had before, I don’t think I ever played New Leaf in November. Oh gosh, the Mush series is my favorite. I adore it. The wallpaper and floor are the best. I often feel like I’m missing out whenever it seems like everyone else is enjoying a game that I’m not playing, either because I can’t get to it right now or because it just doesn’t seem like a good fit for me. It might come from that same place inside that wants to be included, part of the cool kids group. I’ve got much better at being okay with playing what I have time for and what is “up my alley” over the years while passing on the other experiences. Actually, one thing that I think has helped quite a bit is my reading articles and listening to podcasts. I read GI cover to cover each month (though I’m several issues behind currently), I subscribe to several podcasts and YouTube channels and generally try to stay as informed about the goings on in the industry as I can. I don’t just seek out info about the games that I’m interested in, that are coming out on the platforms I own. So even though I will likely never play a Halo (for example), I hear all about it, see plenty of footage, and basically feel familiar enough with the title to “get it” without playing it. Your Destiny example is another reason why I shy away from MMOs. Besides feeling like I would have to be playing it constantly to get my subscription’s worth, there is always something going on in those worlds. So whenever you aren’t there, you’re missing out, right? As a side note, I did have fun in Destiny and wouldn’t mind going back at some point, but in moderation. I think you nailed it in your description, honestly. There is something to be said for getting swept up in the excitement of a new release, but also, I’m more than content to wait until the mood hits me to play a certain game. Oh man. The Destiny struggle is real. I’ve successfully not played it for a week now and I’m feeling a little better about that, but I do miss it. I just don’t have a good balance of playing it and other things. I wish I did.